Although body size increase is suggested to have characterized dinosaurs in general and sauropods in particular (e.g., Hone et al. 2005), there are examples of body size decrease in dinosaur evolution. Perhaps the most notable is the sustained trend of body size decrease in the lineage that led to birds (Sereno 1999). Interesting body size changes also characterize sauropods. Carrano (2005) investigated body size changes in sauropods and observed that the range of body size increases through time and identified body size decrease occurs within both diplodocoid (e.g., dicraeosaurids) and macronarian (e.g., titanosaur) lineages. The recently described Late Jurassic Europasaurus (Sander et al. 2006) is a basal macronarian and represents yet another dwarf sauropod. Importantly, Sander et al. (2006) identified the histological signature of cessation of growth in small-sized sauropods. A closely spaced series of lines of arrested growth that is called the External Fundamental System (EFS) indicates that adult size has been reached, as shown below. However, the fundamental question of how body size change is achieved through changes in development remains unadressed. That is, was dwarfism in Europasaurus achieved by delaying onset of the growth spurt, hastening its offset, leveling its slope, or a combination of the three? 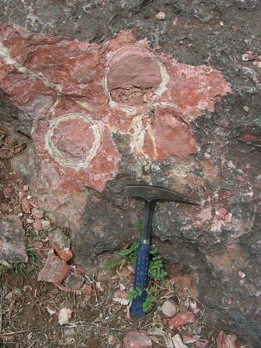 A clutch of three sauropod eggs in the field in Gujarat, India. The spherical eggs have been cleaved by erosion, but the shell outlines are clearly visible. Hatchlings were approximately 1/2 meter long. Body size is the most recognizable characteristic of sauropods, and can be expected to have influenced all aspects of their biology (Peters 1983; LaBarbera 1989). The largest sauropods are estimated to have reached adult body masses of 40 to 70 metric tons or more (Peczkis 1994:appendix), an upper bound reached independently within multiple sauropod lineages (Diplodocoidea, “Seismosaurus”; Macronaria, Brachiosaurus; Titanosauria, Argentinosaurus). 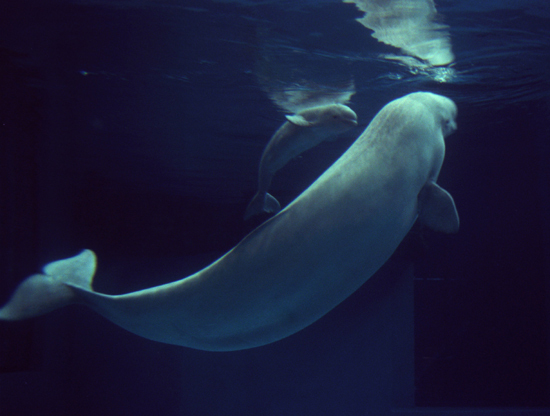 In some extant species, juveniles of large-bodied adults emerge from their mother at considerable size, like the Beluga whale pictured above. In fact, many extinct and extant large-bodied vertebrates gave birth to live young, including chondrichthyans (sharks; Dulvy and Reynolds 1997), mammals (whales; Clapham et al. 1999), and marine reptiles such as plesiosaurs (Cheng et al. 2004), ichthyosaurs (Böttcher 1990; Maxwell and Caldwell 2003), and mosasaurs (Caldwell and Lee 2001). 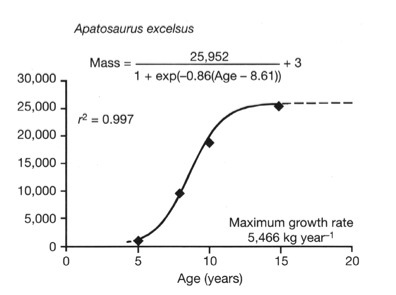 Estimated growth curve for Apatosaurus excelsus (from Curry 1999; Erickson et al. 2001). Mass is based on Developmental Mass Extrapolation and age is inferred from Lines of Arrested Growth observed in histological sections. This sigmoidal plot indicates that Apatosaurus experienced a 10-year growth spurt early in life before its growth tapered and eventually plateaued as it reached adult size. To date, Apatosaurus is the only sauropod for whom a growth curve has been constructed. Silhouette from Wilson & Sereno (1998). 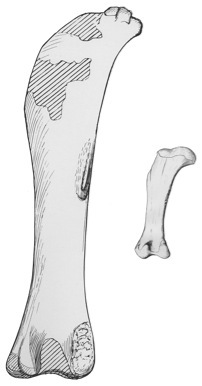 Left femora (posterior view) of the South American titanosaurs Antarctosaurus giganteus (length, 231 cm) and Neuquensaurus australis (length, 70 cm). Images are to scale; both specimens are thought to represent adult individuals (Huene 1929:pls. 20, 36). Although researchers have long assumed that sauropods hatched from eggs, evidence of this reproductive behavior emerged only recently, with the discovery of sauropod embryos inside Megaloolithes-type eggs in Auca Mahuevo, Argentina pictured at right (see Chiappe et al. 1998, 2001, 2005). Sauropods may be the only giants whose young hatch from eggs. Even the largest of adult sauropods began as hatchlings measuring only one meter long and weighing less than 10 kg, a range of ontogenetic size exceeding that for any other dinosaur lineage. The growth strategies that permitted sauropods to attain large body size remain poorly understood. Early speculations into sauropod growth extrapolated growth rates from reptilian growth curves, and hypothesized that sauropods would have taken decades to reach sexual maturity and well over a century to attain their adult sizes (e.g., Case 1978b; Calder 1984). Information from bone histology is providing a new window into sauropod growth and life history strategy. A Beluga whale (Delphinapterus leucas) and newborn calf at the Shedd Aquarium in Chicago. Whales are born large, nearly one-quarter adult body size. Photo from Chicago Tribune. Examination of the pattern of bone deposition in a sample of sauropod species strongly suggests that sauropods attained large adult body size by rapid post-hatching growth (e.g., Rimblot-Baly et al. 1995; Curry 1999; Sander 2000; Erickson et al. 2001; Sander and Tückmantel 2003) rather than by the slow, prolonged growth strategy common in other reptiles (e.g., Enlow and Brown 1956, 1957; Case 1978a; Francillon-Vieillot et al. 1990). More recent work has pulled the focus away from analysis of histological pattern in individual bones and extended it to somatic growth rates via Developmental Mass Extrapolation (DME, Erickson & Tumanova 2000; Erickson et al. 2001). The method requires ontogenetic series, which are available for several titanosaur species, and allows the comparison of growth rates among living and extinct vertebrates, as well as between members of the same extinct group (e.g., Erickson et al. 2001, 2004; Curry Rogers et al. 2003). We will investigate body size evolution in titanosaurs within the context of a species-level phylogeny via two main lines of inquiry: (1) evolution of absolute body size, and (2) evolution of the developmental mechanisms that lead to body size change. We will examine the evolution of absolute body size by mapping a proxy for body size (e.g., femur length) onto phylogeny and reconstructing ancestral states using squared-change parsimony (Maddison 1991), which can be implemented on MacClade and Mesquite (Maddison & Maddison 2000, 2004). With size estimates for nodes and terminals, we will identify the number, magnitude, and timing of body size changes in titanosaur phylogeny. Character correlation tests (Maddison 2000) will allow us to examine morphological and histological features associated with dwarfism and gigantism, geographic or temporal signals associated with body size change, and trends in body size change within particular lineages. In order to test the robustness of our claims, we will use Templeton tests to compare our most parsimonious topology with contrived topologies that maximize or minimize the amounts of body size change. Europasaurus represents an instance of dwarfism early in macronarian history, but there are several instances later in macronarian history that characterize the clade Titanosauria. Titanosaurs include both the largest and the smallest sauropod species, an adult body size range that exceeds that of other lineages (left). The Romanian titanosaur Magyarosaurus dacus is the ”smallest of the largest”, with an adult body length of ~5 m (Jianu & Weishampel 1999) but its age still remains an open question. The saltasaurids Saltasaurus loricatus and Neuquensaurus australis are also diminutive, reaching an adult body length of 7 m and weighing ~10,000 kg (Powell 1986, 1992, 2003). We hope to confirm the adult status of these species. Conversely, other species (Antarctosaurus giganteus, Argentinosaurus huinculensis, Argyrosaurus superbus, Paralititan stromeri) approached what may be the upper limit for terrestrial vertebrate body size, reaching adult lengths of over 30 m and weights of 30-100 tons (Peczkis 1994). 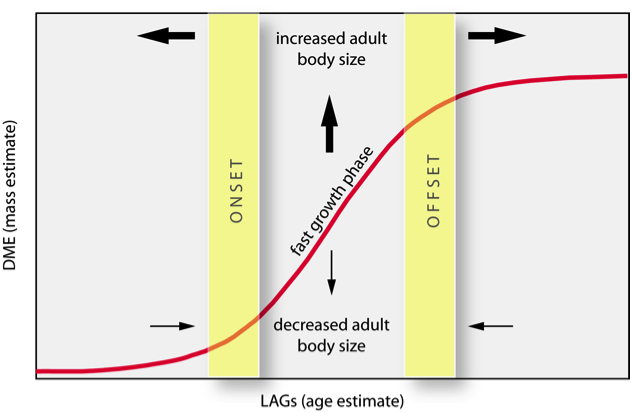 Hypothetical S-shaped growth curve showing histological milestones in early life history. Yellow bars indicate the age of onset and onset of the fast growth phase, which can be translated earlier or later in life to increase or decrease adult body size. Slope of the fast growth phase can be steepened or declined to affect resultant adult body size. An important feature of growth curves is that they can be compared across species, which will allow us to compare our results with those for other dinosaurs or extant species (Erickson et al. 2004). 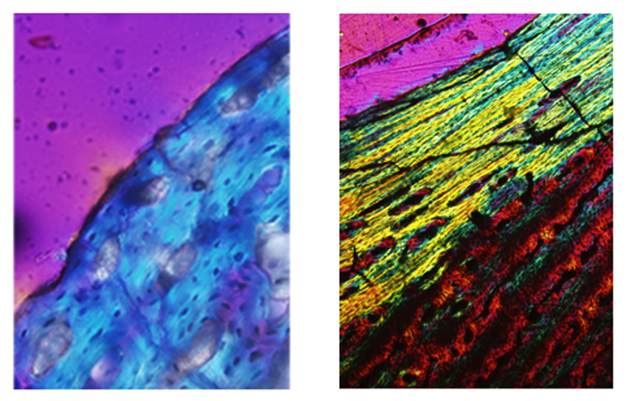 Histological sections of young and old bone. Young bone (left) has randomly distributed, pervasive, open primary osteons. Old bone (right) is poorly vascularized and highly organized, with a well developed External Fundamental System (EFS) at the periosteal margin that indicates cessation of growth.